Wow where have the time gone? It's already the 3rd of May and Mother's Day is this Sunday 8th! Yikes! My mum is notorious for being picky and is very hard to gift for. I usually take her to the shops to let her select her products so she will actually use what I buy her rather than have it sit in the shelf or cupboard back at home. So with Mother's Day dinner done and dusted (we had to celebrate it early so my sister can join us as she is flying back to the UK tomorrow), I just have to find the perfect gift, which is usually either some kitchen gadgets, or some skincare products. So this year for those of you who would like some inspirations on Mother's Day gifting, here are my top beauty gifts for the mum who deserves some pampering and luxury this Sunday. MOR Essentially Yours Mother's Day gift set* - RRP A$24.95. Best sellers from the Essentials range, the Honey Nectar (candied warm almonds and in warm honey and brown sugar), Sugar Rose Tiger Lily (sugary roses mixed in tropical fruits with a floral accent) and the Grape Neroli Clementine (citrus infusion of sweet mandarin and candied orange) set contains a delicious and decadent fragrance soap with a soap tin and a body product beautifully presented in an opulent gift box. See my previous review of MOR Essentials products for more information on how these products moisturise and subtly scents your body. If you can't make up your mind, you can buy more than one set as they are affordably sweet at A$24.95 each. 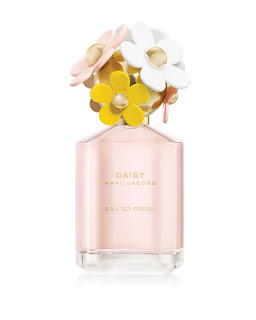 This new lighter and fresher version of the original Daisy perfume has notes of ruby grapefruit, raspberry, mingled with lychee, wild rose, jasmine, apple blossoms and a lingering base of musk, plum and cedar wood. It represents the free spirited mum who is bright and full of charm. It helps that the adorable packaging with the floral cap and pretty bottle will sit right proudly at mum's dressing table. Napolean has put out has 3 different luxurious coloured sets for the mum who loves to look and feel her best. Valued at A$100, each set includes a Nickies Rose cream blush, luminous lip veil and a Prismatic eye shadow Quad and a vintage-inspired cosmetics bag and beautifully gift wrapped and boxed. All sets contains thoughtfully complementary wearable colours that will make sure mum looks classy and elegant. I hope these 3 pickings give you inspiration on what to give mum on her special day, but remember it doesn't need to take that one day in the year to celebrate what a big part mums are in our lives. I am thankful and grateful of my mum every other day. How will you be celebrating Mother's Day this weekend? Mor and Marc Jacobs are available in leading department stores, and selected pharmacies. Napoleon Perdis is available in David Jones, Napoleon Perdis concept stores and selected pharmacies and salons.